Professional Fine Grade 200g Clay Bar. Non-Sticky - Easy to Use. Magna Shine 200 Gram Detail Clay Bar. Easily & safely removes surface contaminants like: over-spray, industrial fallout, tree sap, new car rail dust, bug residue, tar and much more. 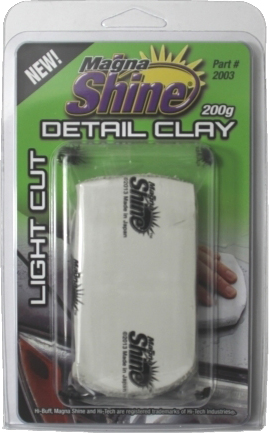 The Hi-Tech Magna Shine Clay Bar is the ultimate alternative to traditional higher priced, high quality clay bars.